. “Pay them a living wage so we can keep them here. This is a life and death decision for us.” — George E. Clark, Jr. I recently read an article about many positive efforts to improve the economy of Marion County. I also read, and am experiencing, the results of one area of negative impact on the economy of Marion County. And that is the continuing exodus of our fire and EMS personnel caused by the embarrassing low salaries — 8.98 per hour – really! We have lost 210 firefighters, paramedics, and EMTs in the last four years. We are now 50 firefighters short resulting in 2 rescue squads being closed, one right outside the gate of On Top of The World. Ambulances are being moved from our stations to cover the City of Ocala resulting in a 25 minute, instead of a 5 minute, response to On Top of The World being the new normal. Just this week, after the tornado hit the SR 200 Communities, the fire department had to gather the specially trained former Rescue 21 crew from their new scattered assignments, bring them to Station 21 to get Rescue 21 then proceed to the disaster area. Thank God no injured residents were trapped in the wreckage of the homes. Don’t developers, builders, realtors, and the commissioners realize that one of the first things that people planning their retirement location check is the quality of medical services, including of course, EMS and fire? 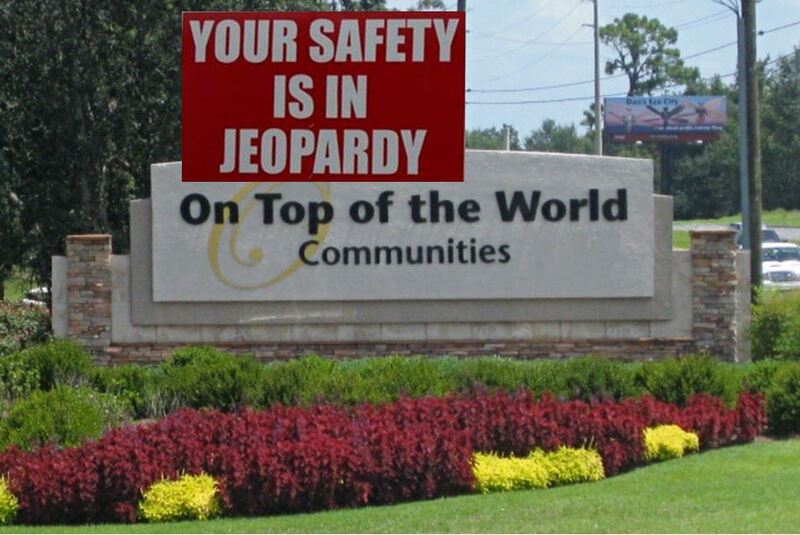 Even if these people don’t care about the well-being of the residents in these 55+ communities, wouldn’t one think it would make good business sense to continue to provide the quality EMS service we had when we decided to relocate to Ocala? People die from long EMS response times; they don’t recover from stroke without medication administered shortly after the stroke. These 55+ communities voted to increase tax revenue for schools to improve the quality of education and these communities do not send one child to school. I want to send a loud and clear message to the County Commissioners that I and most of my neighbors, would be happy to pay a few dollars more a month to keep quality EMS here in Marion County. We have a group of dedicated and trained fire department personnel. Pay them a living wage so we can keep them here. This is a life and death decision for us.